U.S. sales of the Think City start in 2011. Here are the 15 cities Think says are most ready for its electric vehicles. Electric car maker Think North America hasn't said how many U.S. dealers it wants or where it will begin selling U.S. highway-legal EVs. But the U.S. unit of Norway's Think Global AS has said which markets are most likely to see the Think City's sales debut in the first quarter of 2011. Think CEO Richard Canny unveiled a list of 15 U.S. cities deemed the most EV-ready. Los Angeles heads the list, followed by San Francisco, Chicago, New York and San Diego. ASG Renaissance, a market research company in suburban Detroit, produced the list based on electric-vehicle purchase and usage incentives plus market fit. It determined market fit on the basis of traffic congestion, air quality, potential energy sources for recharging and sales of hybrid vehicles in each market. Think will build its vehicles at a plant in Elkhart, Indiana, that will produce only about 20,000 cars a year through 2013 -- and 2,500 in the first year for pilot and fleet customers -- so dealers shouldn't expect a sales bonanza. The plant can increase annual capacity to 60,000. 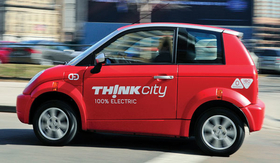 The Think City, currently on sale in Europe, is a two-door hatchback with an optional back seat. It is rated for highway driving, with a top speed of 100kph (about 62 mph). The car's range is 180km (112 miles) on one charge, which costs about $3 (2.20 euros) at average U.S. electric rates. A full charge requires up to 10 hours. The City still needs a few tweaks to be certified for U.S. sales, a company representative said during a media ride-and-drive of the vehicle in Indianapolis last month. For example, the European version doesn't have an airbag sensor to determine whether a passenger is in the front seat. The sticker price is expected to be about $30,000, after federal and state incentives for green cars, said Think North America CFO Tom Kemeny, who is based in suburban Detroit. The car has recyclable plastic body panels and a recyclable interior, the company says.